A new, heart-wrenching video clip shows a bull dragging itself on the ground after breaking its two hind legs at a bullfight in Mejorada del Campo, Spain. 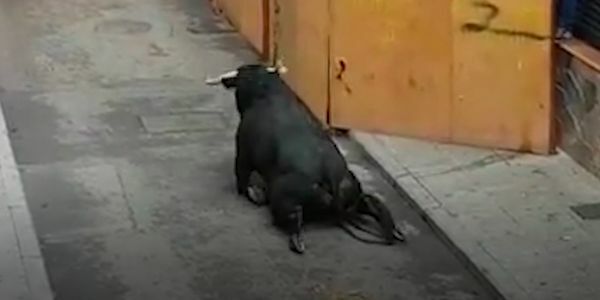 It's already hard to believe that the brutal torture of bulls for entertainment continues to exist and thrive in Spain, but videos like this — that show the lack of care these bulls receive — make it clear why the practice can no longer continue. Please sign now to demand an end to the archaic practice of bullfighting now! The video begins with the bull fleeing a transportation cage at the bullfight. As the bull hits the concrete after making its escape, the impact causes the bull's legs to buckle and break. The bull then drags itself, while the hind legs helplessly trail behind. Not only is bullfighting extreme animal cruelty, it's also dangerous for bullfighters. According to a recent news story, a matador managed to escape death after being gored during a bullfight in the Madrid. But in a horrible twist, the matador quickly recovered to return to the ring to kill the bull and then cut off the dead animal's ears as a trophy. Bullfighting is nothing more than a form of torture that ends in the death of an innocent animal. Spain must end this barbarism now. Please sign and share the petition to demand the Government of Spain ban bullfighting.